Really love your Birch! It's beautiful, love the color! Don't expect the escape velocity to have totally cured a need to knit with KSH. Birch is lovely and I love the color. I know more than one that haven't blocked theirs, I did mine and was happy. You will love having this shawl. okay...I love your Birch...now I'm wanting to knit it....I'm knitting the KSH scarf from LMKG right now, though. I love Dewberry, but unless you want sock yarn, I don't think I have any worthy trades. Birch is just pretty...I can't say enough. Love the color! 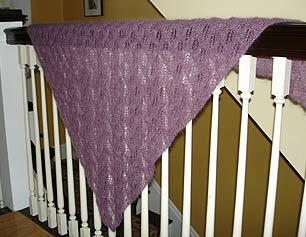 As evidenced by my own use of it for a cowl and one of these days the matching camisole... Which means no trades for me, since I have a current surplus of the stuff myself. But, ah, the purple...yours is the first birch that has tempted me to knit one, as it's the first I've seen in Dewberry. I made the Airy Scarf from Last Minute Knitted gifts in that very color. It uses less than one skein. I'm quite happy with how it turned out. *wow* is all i can say! Your Birch looks great! I never did bother blocking mine--I was happy with the way it looked without it . . . though I'm still tempted to block it, just to see what the difference would be! Your Birch is gorgeous! The colour is gorgeous! WOW! Your Birch shawl is wonderful. I love the color. I've thought about knitting it myself but I have no idea what the "lace cast-on method" is that's called for in the pattern. What cast-on did you use? 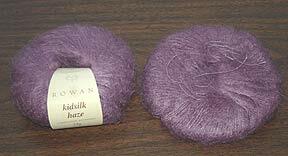 ok, i know i've come late to the party, but i've been gifted with 3 balls of kidsilk haze, and i want to make birch, but i can't find the pattern. where did you get yours? thanks a ton!